This square was part of the ancient Roman city of Durocorturum. It has large houses with interior gardens, and a quiet paved plaza. It's huge and beautiful, with dimensions of 33 by 38 fathoms (about 64m by 74m). In the centre, you can see a beautiful fountain topped by a bronze statue of Louis XV as a Roman emperor. This statue dates from the year 1818, as the previous statue was destroyed during the Revolution. 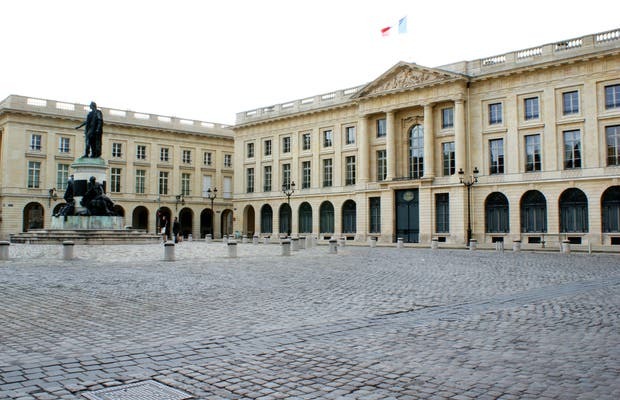 The huge building dominating an entire side of the square is the sub-prefecture of the Marne.